Shockwave was my first top scan and I am definitely looking forward to riding more. While its cycle is incredibly short, the ride is an extremely disorienting experience. All of the axes of motion work together to swing and flip the vehicles for the entire duration of the ride. Honestly, the entire experience reminded me of the Zippers I love so much at carnivals. But one major benefit that this ride has over the Zipper is the absence of the cages since the ride feels so much freer and wilder. Very good top scan, though not as good as Adventurelands old one. The movement was just as good providing a very thrilling and disorienting ride combining spinning with flipping, but the cycle was relatively short. It just feels like you are being tossed about. Not very pleasant. This is the only version of this ride that I have ridden and it is quite good. However, since there is so much movement, I found that in some cycles the different axes of motion actually work against each other a little bit. Other times everything works together and the ride is very intense. A good flat ride. 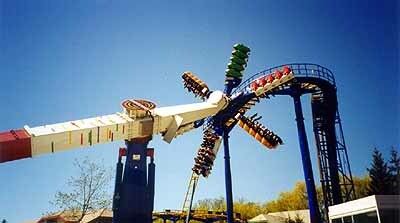 An awesome flat this top scan blew me away with an unpredictable swing every time this ride has a close encounter with the fly as well....if youre with a large group try swaying back and forth....it makes it so much better! Great ride! A very insane flat. I was disappointed when I missed out on the parks Jump2, so I decided to ride Shockwave, the parks Top Scan. Having never been on one, I didnt know what to expect. Its dimensions werent all too impressive, though it made up for the lack of size with a crazy ride. With movement on three different axis of rotation, the ride was full of suprises and intense movement, and perhaps the best part was the narrow gap between the ride and the wild mouse coaster, which gave a great scare everytime we passed by close. One of my favorite flat rides ever, and now I need to get one closer to home. Probably the best flat ride Ive ever been on. It looks incredibly cool, it rides very intensely, and its just a lot of fun. If you time it right, you and your row can help spin your cars a lot more. A whole lot of fun, great spinning, usually short lines, good capacity - a great flat. This ride is intense and unpredictable. It swings you in all directions and throws you all over the place. This ride isnt to be missed. It is fun, rerideable, it has a large capacity, and a long duration.